It’s important to familiarise yourself with Hat Etiquette if you are a regular hat wearer, as failure to do so might cause embarrassment in public. Get to know your Hat Etiquette and when if in doubt ‘doff’ your hat – it’s much better to be too polite rather than rude! In Europe men should not wear hats indoors, especially in churches, homes and public institutions. Generally it’s hats off for inside the home, business or restaurant, for flags, introductions to ladies, funerals and when a funeral cortege passes by. Women are exempt from the men’s rules and it’s hats off whilst at home or at the cinema or theatre if your hat is blocking out the view of people behind. For women wearing men’s hats such as a baseball cap or cowboy hat it’s the same rule as men – men’s hats, men’s rules! When inside a Catholic church a woman’s head should be covered, although this is not a strict rule and usually applies only to worshippers and not to visiting tourists. Ladies should wear a hat to a traditional wedding. Ladies should keep their hats on until the Mother of the Bride removes her hat which is usually when the formalities of the wedding breakfast are over and done with and gentlemen are free to remove their jackets with coffee being served. Don your hat means to put it on. Doff your hat means to take it off. 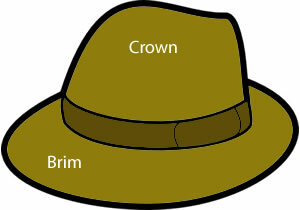 Tip your hat means to grab the brim of the hat and lift up slightly or to grab the brim of the hat and gently tug forward with your index finger and thumb. Grab the crown of your hat. This is the top of the hat that is bowl-like.